Advertisement from Le Photo-Revue Belge, 1902. Établissements Mackenstein were founded in 1872 by Hermann-Josef Mackenstein (* 1848 in Doveren; † 1924). The factory was located at 15 Rue des Carmes in Paris. In the beginning, the company produced small mechanical parts for cameras. In 1888 Mackenstein’s factory assembled the very first film camera equipped with a single lens, able to film up to 20 images per second. This film camera resulted from the work of Louis Augustin Le Prince, inventor of the cinematograph. Chambres de voyage and others. 'Photo-livre'; camera disguised as a book. 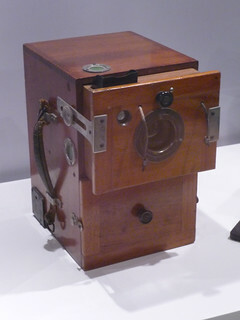 ↑ McKeown shows a camera dated to about 1890, with hinged wooden panels as struts, and a pleated bellows. A similar camera for 13x18 cm plates was sold at the 24th Westlicht Photographica Auction on 23 November 2013. A 13x18 cm strut-folder with metal rod-struts and an unpleated, cloth bellows was sold in September 2006 by Auction Team Breker in Cologne. ↑ 30x30 cm studio camera, about 1890, wood and brass, with 12¾ inch f/4.5 Cooke portrait lens and a behind-the-lens roller shutter, on a large wheeled wooden stand; sold at the Photographica and Film auction by Auction Team Breker on 16 May 2009. Contemporary photographs taken with a Mackenstein camera in the Flickr Commons collection of the Bibliothèque de Toulouse: the photographs were taken in the early 20th century by Eugène Trutat, curator of the Toulouse Museum of Natural History and author of a number of books on photography (see several of Trutat's books at the Internet Archive). They show life in the Pyrenees. The majority are stereo pairs, and it seems likely that most, including the mono exposures, were taken with the same camera. Swiss Patent 5162 of 21 May 1892, Châssis photographique à rouleaux, numérotant ou repérant les clichés (Photographic frame for rolls, numbering or identifying the pictures), describing a roll-film back with a frame counter, incorporating a device to expose the margin of the picture to ambient light through perforated wheels, thus marking the frame number, and also numbers or letters to represent the roll number, etc. ; in short, an early data-back. Addition 335, of 1902, to French Patent 241003 of 1894, Perfectionnements apportés aux appareils photographiques, stéréoscopiques ou non (Improvements made to cameras, stereoscopic or not). The original patent is not in the database at Espacenet, and neither is an earlier addition of 1899 referred to in the text. 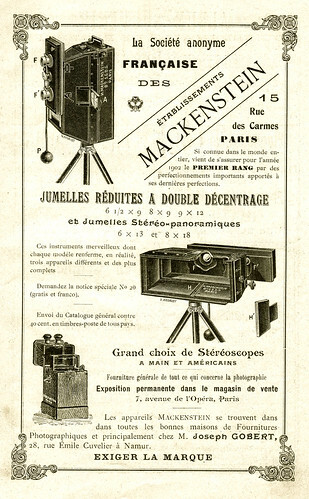 However, it is clear that the first addition described a removable septum mounted in a stereo camera; this is to be put in place when the camera is to be used for stereo or simple photographs, or removed to allow panoramic photographs; the camera is thus one of the jumelles stéréo-panoramiques offered in the advertisement pictured above (and the original patent presumably describes the design of the camera without this facility). This second addition notes the risk that the photographer will forget to mount/demount the septum, and so waste plates and miss the desired photograph; also the risk that a demountable part may be lost. It goes on to describe a septum mounted on a sprung hinge, which erects itself automatically when the lens board is arranged for normal or stereo photography, and collapses when it is arranged for panoramic use. Additions 1676 of 1903 and 3253 of 1904 to French Patent 317387 of 1901, Appareil photographique pouvant etre alternativement muni d'objectifs de différents foyers et permettant de faire l'instantané et la pose (Camera able to be fitted with lenses of different lengths, and allowing instantaneous and bulb exposures). The patent (not itself in the Espacenet database) describes the design of a focal-plane shutter camera, the instantaneuous exposure variable by avrying the width of the slit between the two shutter blinds, and these two additions to the patent describe improvements in the controls, including in the second addition a scale showing the slit-width of the shutter so that the user does not have to open the camera to judge this. French Patent 320234 of 1902, Système permettant de se servir à volonté de plaques ou de pellicules pour la photographie, à l'aide d'un meme chassis à escamotage ou magasin (System allowing one to use either plates or film in photography), describing a holder for cut film, with a dark-slide, allowing it to be loaded in plate magazines. The patent states that a magazine for a certain number of plates will hold twice that number, plus one, of sheets of film in these holders. French Patent 383733 of 1908, Obturateur de plaques photographiques à fente réglable et à vitesse variable (Photographic shutter with variable slit-width and speed), describing a focal-plane roller shutter. French Patent 385048 of 1908, Matériel photographique pour la prise des vues et le développement en plein jour des plaques en couleurs, autochromes et autres (Photographic equipment for taking views and developing colour plates, Autochrome and others, in daylight). The patent notes the difficulty of handling Autochrome plates (which have the sensitive layer on the back) in darkness when loading plate-holders, without marking the emulsion with fingerprints, and similar difficulty when transferring them from the holders to a developing dish in a dark-tent or similar arrangement in the field. The invention described in the patent comprises firstly of a design of plate-holder said to be easy to load in darkness, and secondly of a matching dark-box to contain the developing dish, to which the plate-holder is fitted, in such a way that the plate can be dropped out into the dish with no handling at all. French Patents 406861 of 1910, Appareil pour l'exposition successive des vues photographiques (Machine for successive display of photographic slides) and 436338 of 1912, Appareil pour la vision d'une série de vues photographiques sur verre (Machine for viewing a series of photographic glass slides), describing a mono or stereo slide viewer. The viewer takes slides from a magazine at the bottom, and simply places each in turn in front of a ground-glass screen lit by ambient light, and behind the viewing lenses. The first version of the device has a crank-operated slide-changer; in the second this is replaced with a plunger-operated mechanism. In each, there is a shutter to darken the view during the changeover. This page was last edited on 28 February 2018, at 06:28.